With the recent Supreme Court decision to legalize marriage equality, we thought it was a great time to highlight one of our very inspiring HEART students, an openly gay LGBTQ activist, who has done a tremendous amount already to make a positive difference in the world. 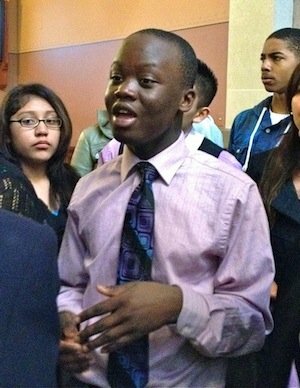 17-year-old Jacques Agbobly moved from Togo, Africa to Chicago, Illinois when he was only 9. He was bullied in school for being different and made to be a target by some of his classmates. While no one should have to experience what Jacques went through, the experience drove him to dedicate much of his life to creating a more just world for those who have been marginalized or oppressed. When Jacques’ class was in the HEART program they decided that they wanted to do a service project around bias-based bullying and, more specifically, the bullying of LGBTQ students. They put together an entire assembly to spread awareness about the issue and to promote respect for all. Jacques was voted by his classmates to be the project leader and the assembly was a great success. Jaques has gone on to work on many projects in his school and community to spread awareness about HIV/AIDS and to break the stigmas that still surround the disease. Additionally, he has been involved with the marriage equality campaign. Jacques is a true solutionary. We interviewed him to learn more about his experiences. Q: How has service learning changed your life? Jacques: It has changed my life tremendously. I have gotten the opportunity to help others get involved. I have met so many wonderful people and have received recognition for my work. I don’t do this to be awarded. I do this because I want to inspire others to get involved and when I see that happening, that in itself is life changing for me. Q: Can you tell us about some of the recognition and awards that you have received for your volunteer work? Jacques: For my work, I have received the Choosing to Participate award from Facing History and Ourselves. I was featured in the magazine, TimeOut Chicago. I recently received a Youth Courage Award from the Colin Higgins Foundation. I was featured in L.A Times, Windy City Times. I also received a 30 under 30 award from Windy City Times, and a POZ100 2014 award from POZ100 magazine for my work in the HIV/AIDS community. I just shot a commercial/ad campaign for Esurance, which was featured on The Huffington Post and has received over a million views on Facebook and fifteen thousand views on YouTube. Q: For the past couple of years you participated in our live, online service learning program at Collegio San Carlo in Milan, Italy. What was it like sharing your service learning experience with students in another country over the computer? Jacques: It was and continues to be a wonderful experience… I have shared with them my work with the LGBTQ community, HIV/AIDs community, and recently my work with Marriage Equality… I love to hear what other youth are doing to help change their community. Hearing about all the wonderful things these students are doing inspires me more to do what I do. I take this opportunity to learn everything I can about issues that others are interested in and ways they approach solving it. Q: Some of the students from Collegio San Carlo came to Chicago and you were able to get together with them. Can you talk about what it was like to meet the students in person and a little bit about what you all did or talked about together? Jacques: It was amazing! Getting the opportunity to have met these wonderful students from Italy was wonderful. I loved chatting with them over the Internet, but getting the chance to meet them was amazing. I still stay in touch with a few of them and we’ve just become such good friends over the years. I love to see what they are up to. Jacques: I am getting ready to apply for college. I am an aspiring fashion designer and my dream would be to attend Parsons, The New School for Design in either New York or France. I ultimately want to merge both my activism work with my fashion design dream. Q: What advice would you share with students who are interested in getting involved with making a positive difference in the world, but are not sure with how to get started? Jacques: My best advice would be to always be inspired, have patience, and never give up. As an activist for human/animal rights, you are always going to face a lot of obstacles. There will be people who are not going to support your cause, but staying true to your goal will get them to understand. Jacques: I just wanted to say that I would not be where I am today without the support from everyone at the HEART Program. This all started as a requirement for class but throughout the process I grew to love service learning projects and it has changed my life tremendously. Thank you to everyone who has believed in me all these years.